Matthew Beach, far left, sings with the Vienna Boys’ Choir. 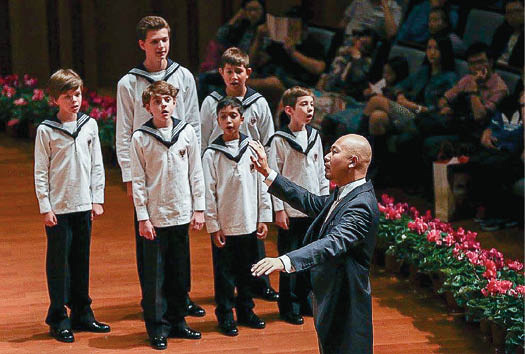 Matthew Beach, 12, has just completed a tour singing with the Vienna Boys Choir in China, Hong Kong and Taiwan. A former student at All Saints School in Endicott, Matthew is having the experience of a lifetime. He is now in Austria and will perform with his singing group, Haydnchor, for a few weeks before heading out to tour in Germany for a month. Matthew has enjoyed singing since he was 7 years old, performing at churches such as St. James and Holy Family in the Endicott area, as well as in plays through community organizations such as the Endicott Cider Mill Playhouse. Matthew’s mother, Tami, realized that he had an extraordinary voice and arranged for him to study with professional music teacher Jan DeAngelo. Up until last March, Matthew was leading a fairly normal life, playing hockey, video games and spending time outdoors with his friends. That changed, however, after his mother, together with her son, responded to a call for boys to audition to sing in the Vienna Boys’ Choir. Matthew and his family were then invited to Kingston, Ontario, for an audition following a Vienna Boys’ Choir concert on March 26, 2015. Following his audition, Matthew and his parents were shocked when the choir master advised them to take Matthew to Austria immediately if they could. While most boys recruited to the choir attend a camp in July prior to officially joining the choir, the choir master told Matthew and his parents that he might be asked to come to Vienna sooner. Two days later, Tami Beach received an email from the president of the Vienna Boys’ Choir requesting Matthew come to Vienna as soon as possible to learn German for classes and practices that started in May. Matthew is one of the few boys in the world selected for the Vienna Boys’ Choir. The choir consists of about 100 boys from 30 nations. The boys are divided into four groups of 25 each that tour for about 11 weeks of the academic year. The young men live in an apartment complex inside a palace that is around 500 years old in Vienna. They practice singing four to five hours a day and attend classes taught in German.